Lego's new "Welcome to Apocalypseburg!" building set is now available. "You maniacs! You blew it up!" You can re-enact the climactic scene of 1968's "Planet of the Apes" with Charlton Heston's astronaut character screaming on the beach next to the Statue of Liberty, thanks to a new Lego set based on "The Lego Movie 2: The Second Part." Included in the set are 12 new minifigures, some of which have already appeared in movie previews: Emmet, Lucy, Batman, Scribble Cop, Harley Quinn, Green Lantern, "Where are my pants?" Guy, Larry the Barista, Chainsaw Dave, Mo-Haw, Roxxi, Fuse and an unnamed rat figure. There are plenty of fun "Easter eggs" for builders of this set, who Lego recommends should be at least 16 years old. Lucy's hideout, for example, has a secret compartment inside of the bed — which includes a love letter from Batman. The gym has some sort of alien invader decoration, and inside Lady Liberty's head is a hidden chill-out room complete with a telescope and three lookout platforms. The Lego "Welcome to Apocalypseburg!" 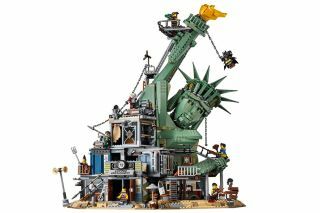 building set includes a buildable Statue of Liberty, complete with a burning torch. You can fulfill more geek dreams with the buildable tattoo machine and a couple of buildable telescopes to look at the stars. If you get hungry, there's a rooftop diner complete with a deep-fat fryer, oven, table and even some ingredients. And when the bad guys come, several of the rooms have weapons available. Lego's "Welcome to Apocalypseburg!" building set comes with 12 minifigures, including Batman, Harley Quinn and the Green Lantern. The new movie is a sequel to 2014's successful "The Lego Movie," which followed Emmet (Chris Pratt), a rule-abiding figurer who suddenly is recruited to save the world. In "The Lego Movie 2," the citizens of Bricksburg must deal with an invasion from outer space.